I still cook. Often. And I even try new recipes occasionally. I just rarely have time to sit down and write. However, this is a recipe I want to remember. I have made it a couple times now. It is fairly easy to make and is quite tasty. 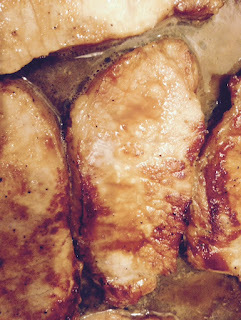 Chicken in Lemon Butter Sauce. Yum. Season chicken with salt, pepper, and paprika to taste. Melt 2 Tbsp butter in an oven-proof skillet (I highly recommend cast iron) on medium high heat. Brown chicken on both sides for a few minutes. Set chicken aside. Add remaining Tbsp butter and garlic. Cook for a minute or two, browning garlic. Then add heavy cream, chicken broth, Parmesan, lemon juice, and thyme. Bring to a boil. At this point, you may add spinach if you are using it. Cook a few minutes until it is wilted and the sauce has thickened. We ate ours with rice, bread, and salad. But this is a recipe I do want to remember. I found it here. I have made it twice now and have loved it both times. Plus it is easy and fairly quick. My favorite combination. Mix brown sugar and spices/seasonings. Rub the sugar mixture into the pork chops. I just put the mixture into a bowl then kind of "dredge" the chops in it. Heat olive oil in a skillet at medium/high heat. I use a cast iron skillet because it can go into the oven. Once the oil is hot add the pork chops to the skillet. Cook about 5 minutes on each side until they are browned. Place in the oven for an additional 5-10 minutes (if you are NOT using a cast iron skillet, transfer to something oven safe) to thoroughly cook the pork chops. Note: I don't do paprika or cayenne due to food issues for one of my kiddos. So I just add a little of my own choices like a little onion powder and white pepper). We ate this meal with half baked potatoes (completely baked but halved :) ) and French bread. It is quite simple, quite good! This past week I was trying to think of what I wanted to make for our "Mexican" food (which we typically have once a week). The only problem is I am out of tortillas and tostada shells that I typically use for those meals. So I thought, "What about nachos?" 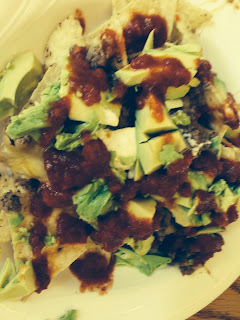 It reminds me a lot of the tostada recipe I use but with chips instead (and quicker). So I decided to give it a try. I am happy to report that we have a new "easy go to" recipe! Optional: Sour cream, salsa, tomatoes, avocado, lettuce, olives, etc. Add taco seasoning to ground beef according to package directions. Since I use homemade seasoning, I just added about 1/2 cup water. Simmer for just a little bit. 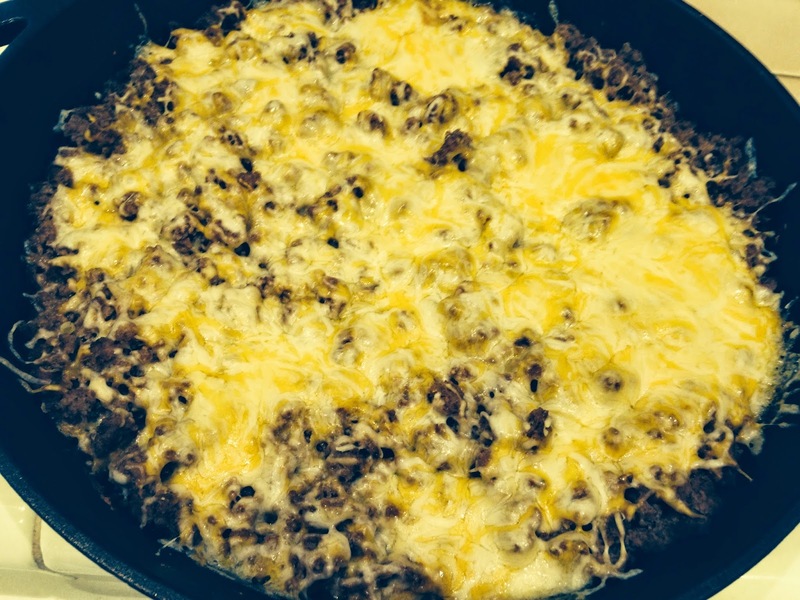 In a casserole dish (or in a cast iron skillet which is what I did), spread the refried beans. Sprinkle the onion on top. I also added some cilantro just because I love cilantro. Spread ground beef on top. The original recipe suggests tucking the chips around the edges of the mixture for the last 5 minutes but we ended up just putting some of this on our own chips. Like I said, simple but good. As you can see, I added avocado, sour cream, and salsa. 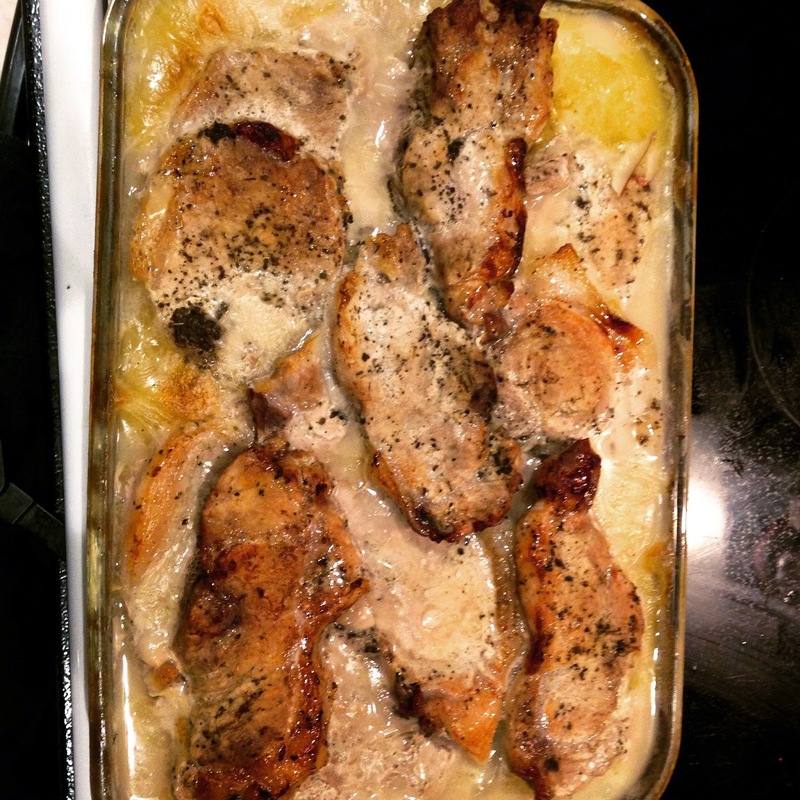 One day my dear friend Carol mentioned a favorite pork chop recipe she had found on Pinterest. She told me how easy it was and how good it was. That was all I needed to hear. So a few days later I perused her Pinterest page and found the link. I could not wait to make them. And the verdict is? Yes, definitely a keeper. We will be having this again. Soon! 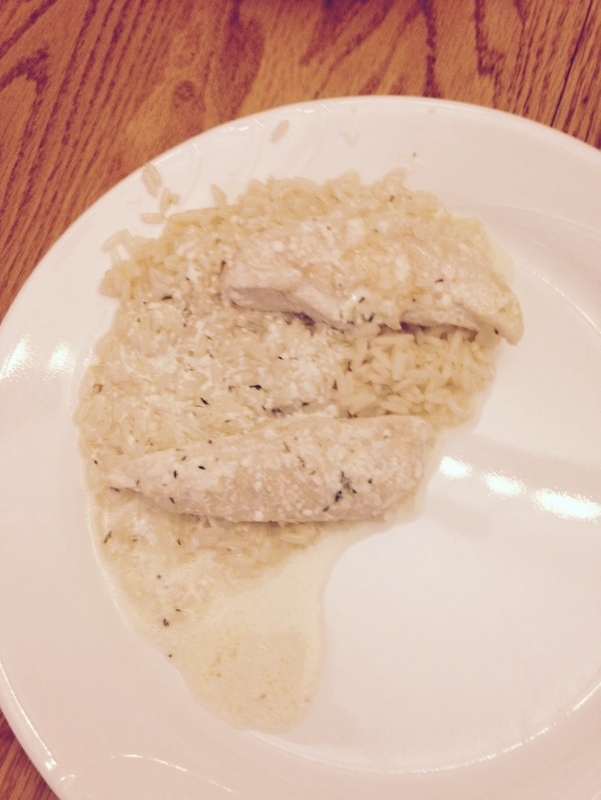 Combine the Parmesan cheese, bread crumbs, black pepper, and garlic powder on a plate or in a shallow bowl. Spray/rub olive oil onto the pork chops. 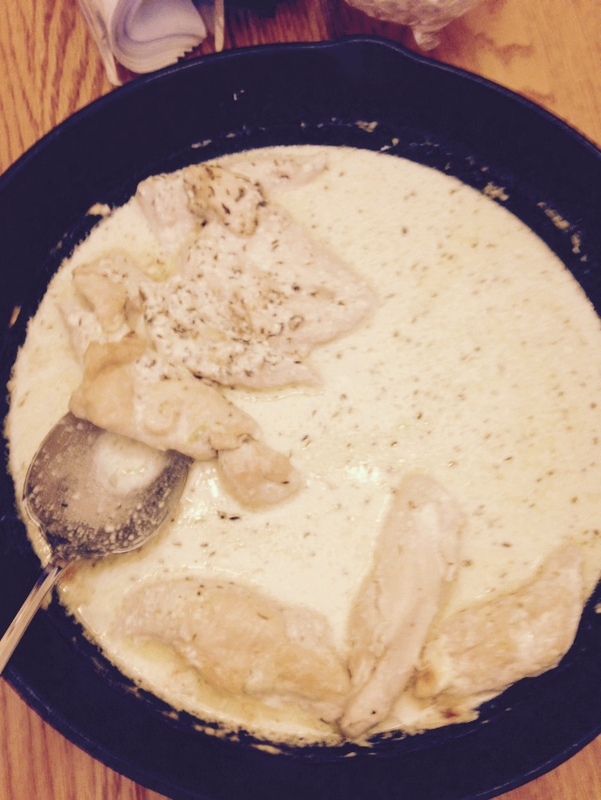 Dip into the cheese mixture, covering the pork chops completely. Place on a cookie sheet (I just covered one with Parchment paper). The other night I was cleaning out my fridge. You know, like that deep cleaning. Pull everything out. Toss the old stuff. Wipe down/wash the shelves. Put things back nice and neat. It was quite an exciting evening. Then I remembered that I had told my kids I would make breakfast for the morning. At this point, it was maybe 11 p.m. And I had more work to do. I searched for quick and easy cinnamon rolls. And this recipe popped up. So they aren't exactly cinnamon rolls. But they looked easy, fairly quick, and tasty, so I went for it. Because of our food issues at our house, I had to change it up just a little bit. The original recipe uses butterscotch pudding mix (and I am pretty sure my sister does a similar recipe with vanilla pudding mix). We can't/don't do instant pudding mixes, so I did no pudding at all. And it still worked for us. If you are using nuts (we didn't this time), spread the nuts in the pan first. Place 9 frozen dinner rolls in the pan. Mix the butter, brown sugar, and cinnamon. Spread half the mixture over the frozen rolls. Place 9 more frozen dinner rolls in the pan (like a second layer). Spread the second half of the butter mixture over the rolls. Cover loosely with parchment paper. 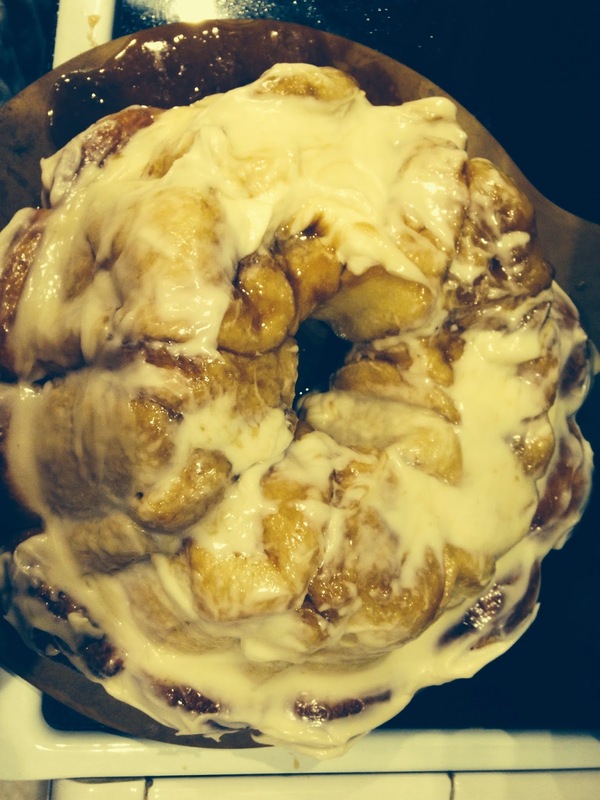 The next morning, you will find a risen mound of dough and butter yumminess. Allow to cool slightly then invert onto a serving platter. You can stop there and probably be fine. Or you can add a little cream cheese frosting. Use a mixture to cream the cream cheese and butter together. Add in powdered sugar a little at a time until it is light and fluffy. Anyway, I have been making these for a while but never got around to posting them. I don't remember how I found the recipe, but I am glad I did. 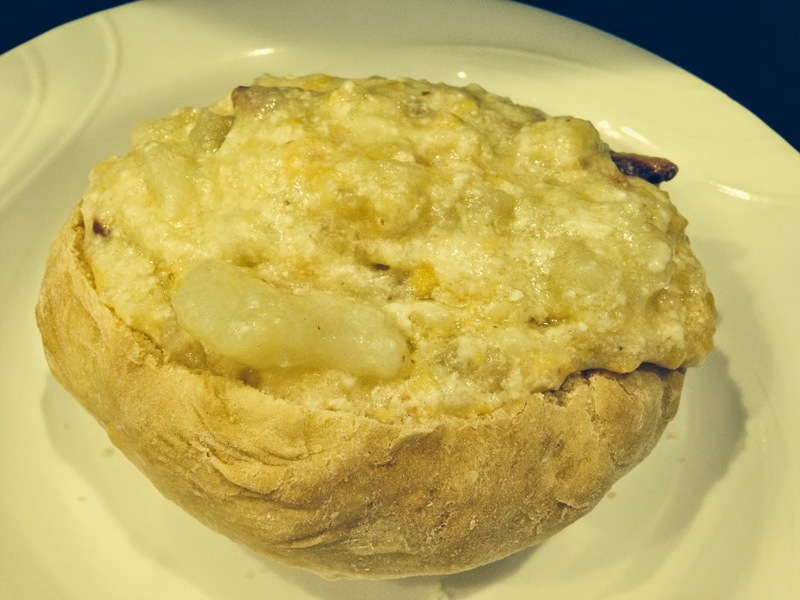 When I eat baked potato soup, I always want some bread with it. I mean, can't have enough carbs/starch, right? So when i saw these, bread bowls, it seemed like THE way to go. The original recipe involves a bread machine. If you know me at all, I typically prefer to knead and mix by hand. So I do. Either way, it is easy. And delicious. This recipe makes 4. I sometimes halve it just to make a couple or double it to make more (then freeze any leftovers). My recipe is for hand mixing. For the bread machine, check out the original recipe. Add yeast and sugar to the warm water in a bowl. Give a few minutes to "foam" (to show the yeast is working). Then add in the olive oil, Parmesan, flour, and salt. Knead for a few minutes, adding flour as needed. It should not be too sticky. Cover the bowl with a warm towel and set aside to rise. Mine typically takes about an hour, but house temperature and weather can play into it. After the dough has doubled in size, punch it down. Divide the dough into four parts, shaping them into balls. Place on a greased cookie sheet (I typically use parchment paper). Let the dough balls rise for about 30 minutes. Bake at 400 for 15-20 minutes until golden brown. This picture doesn't do this dish justice. Oh, it showcases the pork chops perfectly (thanks to the Hubs for taking it). But what you can't see is the pile of tender potatoes underneath the broth/sauce. The one and only negative about this meal was that it needed to cook for an hour and a half. By the time you throw in prep time, it takes about 2 hours total. That isn't a big deal on a Saturday. On a Monday, it meant a late dinner for us. In a saucepan, melt the butter and add the flour over medium heat. Add the chicken broth, stirring often until it begins to thicken and bubble. (I used a whisk to remove lumps) Then cook one minute longer. Add salt/pepper to taste. Meanwhile, heat the oil in a skillet. Brown the pork chops (each side), sprinkling the sage, salt, and pepper over the meat as it cooks. Cover tightly with aluminum foil. Bake for 1 hour. After an hour, remove the aluminum foil and continue to cook for another 30 minutes. It is two hours after dinner here, and my house still smells amazing. This blog is just one mom's avenue for sharing recipes that work for us.